The Meteorological Service Department has forecasted more thunderstorms and heavy rains as the country moves into the raining season. 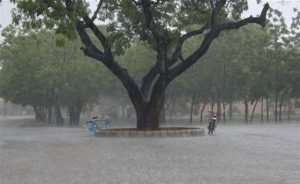 A few nights ago, a downpour wreaked havoc in parts of the country, injuring some people and destroying property. Earlier the Department clarified that rainfall experienced last month in the Southern part of the country did not yet indicate the beginning of the rainy season. But, in an interview with Citi News, Head of Forecasting at the Meteorological Service Department, Joseph Portuphy said Ghanaians should brace themselves for more rainfall in the middle belt and coastal areas. “It will also depend on the type of rain that is coming. If is a convective rain, then definitely there will be a lot of thunderstorm and strong winds in it. If you look at how the sun is shinning, there is a lot of energy in the atmosphere and coupled with that it will give us strong wings with thunderstorms and heavy rains”, he warned. Last week, a storm caused significant disruption in Kumasi. There were incidents of flooding in the metropolis during which a huge billboard collapsed and trapped some people in a vehicle. One person was trapped in his vehicle after a giant billboard fell on it at Afful-Nkwanta in Kumasi during the downpour. Eyewitnesses sad two people — the wife and child of the trapped victim — were rescued and rushed to the hospital. The downpour also caused a total blackout in the city. Meanwhile, the Accra Metropolitan Assembly (AMA) is working to minimize the impact of perennial floods in the Accra metropolis. It has begun desilting storm drains ahead of the rainy season to prevent flooding. Public Relations Officer for the AMA, Gilbert Ankrah says his outfit is adequately prepared to avert such incidents.